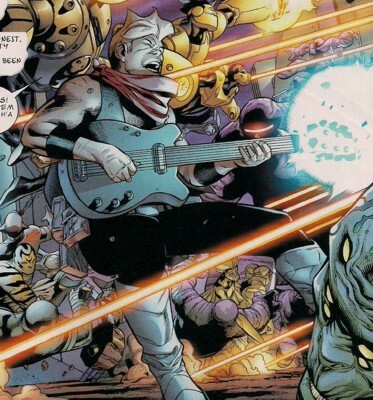 Powers/Abilities: Johnny Guitar possessed a modified guitar that sent out shockwaves of sound when he strummed it, destroying objects in a crash or crushing human bones with its sonic fury. (Avengers: The Initiative#27 (fb)) - Johnny Logan and Jack Dulouz met in high school in Clack, Mississippi and formed a band together. They both got their girlfriends pregnant and had to go out and find real jobs, but they wanted to focus on their music and so formed a traveling band, getting some notoriety, but no money. Johnny and Jack started committing small crimes. (Dazzler#20 (fb)) - When the rest of the band, Marx, Beefer, and Hunch, found Johnny and Jack robbing the manager Mr. Holman in Sault Ste. Marie, Michigan, Jack and Johnny grabbed an acetylene torch and a crowbar to force their friends to keep quiet. Hunch, seeking to protect himself, kicked the torch back into Jack's eyes. Johnny tried to run for it, but was stopped until the cops arrived. (Avengers: The Initiative#27 (fb)/Dazzler#20 (fb) - BTS) - In prison, they met the Trapster, who regaled them with tales of his life as a super-villain. After their release, they visited the Techmaster, who gave Doc glasses that enabled him to see shadows and shapes, and gave them both weaponized instruments. They christened themselves Johnny Guitar and Doctor Sax. (Dazzler#20) - Johnny Guitar and Doctor Sax immediately set out to find their former bandmates to get revenge. Johnny used his guitar to break into the building, then he destroyed parts of the room to scare them. Doc then used his sax to inspire madness in them. Johnny kissed Dora, making the others mad, so Doc tossed Hunch into the couch with a blow. Johnny soon tied them all up, setting Hunch's baby Justin Panasci off to the side, and they planned to torment their foes before killing them. To torment Hunch, Doc turned his sax on the baby when suddenly Alison Blaire, the Dazzler, rushed into the room, grabbed the baby, and tried escaping on roller skates, but Johnny destroyed her skates with a strum. 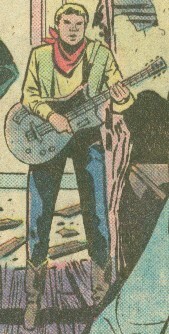 As Johnny strummed his guitar, Dazzler hit him with a light burst. She and the baby were temporarily affected by Doc's saxophone, but she soon vaporized it with a laser burst. (Dazzler#20 - BTS) - Sax and Guitar were taken into police custody. (Marvel Year-in-Review '92) - Doctor Sax and Johnny Guitar later played at the Springdale, Connecticut branch of the Bar With No Name. (Avengers: The Initiative#27 (fb)) - Considering themselves bonafide villains now that they'd battled a hero, they quickly tried returning to crime after their release from prison, when Doc got a new saxophone. They tried getting membership in the Sinister Six, the Brotherhood of Evil Mutants, the Death-Throws, and the Circus of Crime, but were rejected at every turn. Johnny's wife, Revonda, finally left him, taking his daughter with her, Doc went on disability, and Johnny took a job as a janitor at a casino, though they occasionally played for a gig. When the Trapster ran into Johnny and told him the Initiative was recruiting, Johnny convinced Doc, who was reluctant as he had three kids to support now, to join up. After a period of training, they were assigned to the Shadow Initiative and told they'd be sent in to liberate Prison 42 from alien invaders. Johnny, a bit worried, went to talk to Taskmaster, but overheard him telling Constrictor that the Shadow Initiative were nothing but cannon fodder. After vomiting, Johnny told Doc that everything was cool, but he decided he had to do something to save his friend. Johnny checked in with Trauma about the benefits to his family if he were to die, and learned that Doc would be provided for if he were injured in combat. Johnny feigned fury at Doc and hit his hands with a blast from his guitar, disabling Doc and rendering him unfit for duty. 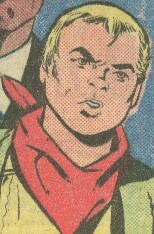 After getting roughed up by Taskmaster, Johnny was thrown back into the line of duty. Physique told the confused Doc that he couldn't fight, and Johnny, unable to explain, left a long letter for his daughter with Doc. (Avengers: The Initiative#27) - The Shadow Initiative launched to the attack through the Negative Zone portal and Johnny was the first killed in combat. Dr. Sax later returned to his wife and three children. (Avengers: The Initiative#30 - BTS) - When Nightmare attacked Camp HAMMER, an apparition of Johnny Guitar haunted Taskmaster. Comments: Created by Danny Fingeroth, Frank Springer, and Vince Colletta. Johnny Guitar is a 1954 comedy /western starring Joan Crawford as Vienna and Sterling Hayden (best known as General Ripper from Dr. Strangelove). The plot revolves around Crawford and another woman as feuding saloon owners, while the wry Johnny Guitar is alternately manipulated by and manipulates them. Thanks to Omar Karindu for the above information concerning the name! Thanks to Brandon Nash for pointing out Johnny's full first name, his daughter's name and the full names of Honch and Dora from Johnny Guitar's OhotMU A-Z Update#3 (2010) profile. Profile by Chadman & Snood.